The importance of facing, understanding, predicting and even mitigating uncertainty has been well acknowledged and studied in various fields such as philosophy, physics and finance. 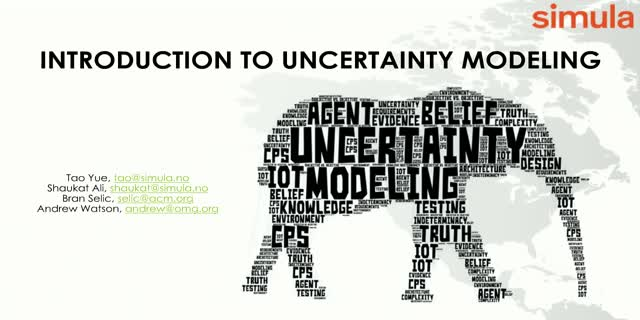 In terms of software and system engineering, due to the increasing complex of large-scale systems themselves, and the dynamic and unpredictable deployment and operation environments of such systems, increasing attentions have been given to address challenges of explicitly specifying and modeling uncertainty. Uncertainty Modeling (UM) aims to promote and enable explicit specifications of uncertainty and uncertainty related concepts, at various contexts (e.g., developing large-scale Cyber-Physical Systems and Internet of Things, for different purposes (e.g., enabling uncertainty-wise requirements specifications, modeling, verification and validation, e.g., facilitating the definition of uncertainty-wise testing strategies), and at different phases of the development of such complex and uncertainty-inherent systems (e.g., requirements, architecture, design, testing and operation). In the context of OMG, we see a diverse set of uncertainty modeling applications, such as 1) integrating with UML use cases, SysML Requirements Diagram, to enable requirements V&V, 2) capturing uncertainty as part of SysML or UML models to facilitate design and/or testing, 3) integrating with BPMN and other OMG standards to facilitate different kinds of analyses and generations. OMG’s Uncertainty Modeling Request for Information (RFI) is currently open for responses. The RFI aims to solicit ideas, discussions, comments, recommendations, user needs and experiences about uncertainty modeling. Collected responses will be carefully analyzed and will be used to identify requirements, based on an RFP for an UM will be developed. Instructions for responding to this RFI are specified in the OMG Uncertainty Modeling Request for Information document (ad/16-09-02 (Uncertainty RFI)). Translating narrative guidelines into a format that is consumable by a digital platform is a challenging but necessary step to improving outcomes in a digital age. A framework for using BPM+ (BPMN, CMMN, DMN) for expressing care pathways will be reviewed, along with the experience of the American College of Obstetricians and Gynecologists in how to put these models into a production system.